There are 7 cervical vertebrae, the atlas, axis and the similar C3-6. There are 12 thoracic vertebrae and five lumbar vertebrae. Five fused sacral segments form the sacrum and the coccyx has four fused segments. 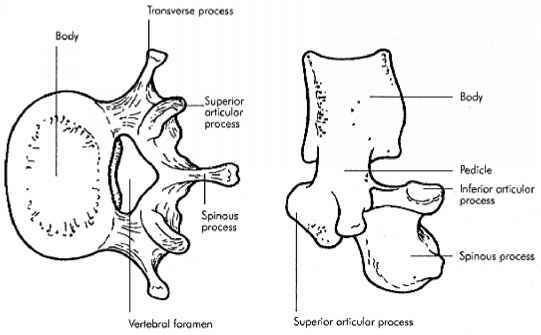 Structures of typical vertebrae are shown below in Figures CA.24-CA.27. 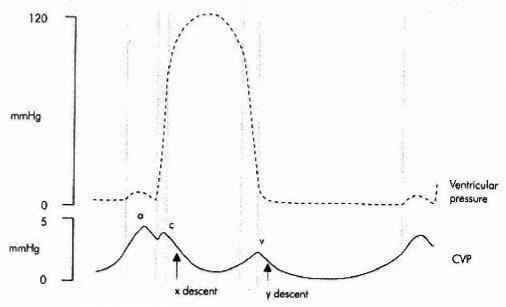 The thoracic inlet slopes downwards and forwards, making an angle of 60° to the horizontal. It is approximately 10 cm wide and 5 cm from front to back. The thoracic inlet is bounded posteriorly by the first thoracic vertebra, anteriorly by the manubrium and first rib and laterally by the costal cartilage. The shape of the inlet is said to be kidney shaped due to the protrusion of the body of T1 into what would otherwise be an oval. The thoracic inlet transmits the trachea, oesophagus, large vascular trunks (brachiocephalic, left carotid and left subclavian arteries and brachiocephalic vein), vagi, thoracic duct, phrenic nerves and cervical sympathetic chain. See Figure CA.28. The first rib is short, wide and flattened. It lies in an oblique plane. The first rib has a rounded head with a facet that articulates with the body of T1, a long neck and a tubercle that articulates with the transverse process of T1. The inferior surface of the rib is smooth and lies on the pleura. 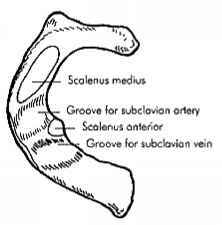 The scalene tubercle on the medial border of the rib indicates the attachment of the scalenus anterior muscle. Anteriorly the upper surface of the first rib gives attachment to the costoclavicular ligament and subclavius muscle. Between the pleura and the neck of the rib lie the sympathetic trunk, the large branch of the anterior primary ramus of T1 passing to the brachial plexus and the superior intercostal vessels. 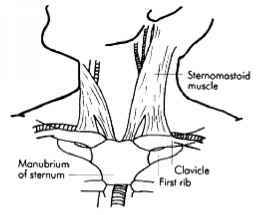 The inner margin of the first rib gives attachment to the suprapleural membrane (Sibson's fascia) which joins the transverse process of C7. See Figure CA.29. 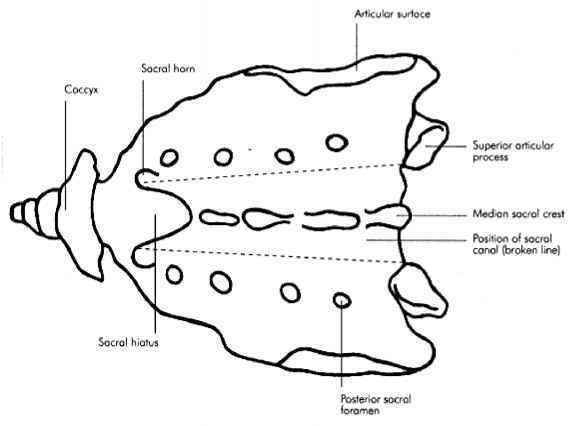 The intercostal spaces are bounded by their related ribs and costal cartilages. 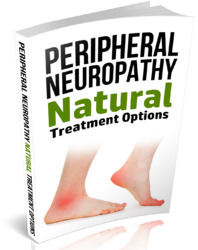 They contain the intercostal muscles, vessels and nerves. 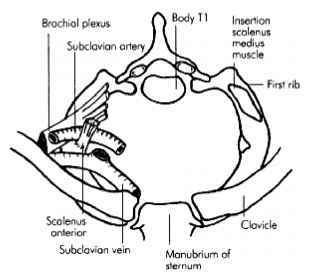 Deep to the intercostal spaces lies the pleura. The intercostal muscles are arranged as follows: the external intercostal muscle descends in an oblique manner forwards from the lower border of the rib above to the upper border of the rib below. The internal intercostal muscle is an incomplete sheet between the ribs and the pleura which attaches to the sternum, costal cartilages and ribs. Additionally, there is an innermost layer of muscles that is incomplete and consists of sternocostalis, the intracostals and subcostals. 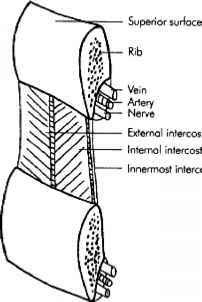 The contents of the intercostal space are the components of the neurovascular bundle. 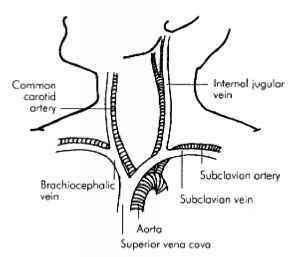 These are the posterior intercostal vein, the posterior intercostal artery and the intercostal nerve, from above downwards. The neurovascular bundle is protected by the costal groove of the upper rib as shown in Figure CA.30. The most important muscle of the abdominal wall is the rectus abdominus. This is inserted into the pubic symphysis over a 3 cm wide area and inserts onto the 5 th, 6th and 7th costal cartilages. The muscle generally is marked by three fibrous intersections on its anterior surface. Rectus abdominus lies within a sheath—the rectus sheath formed by a split in the aponeurosis of internal oblique. The rectus sheath is reinforced posteriorly by the aponeurosis of transversus abdominus and anteriorly by the aponeurosis of external oblique. At its uppermost extremity the rectus lies directly on the costal cartilages because neither internal oblique nor transversus abdominus extend superiorly to this level. Below the arcuate line of Douglas (half way between umbilicus and pubis) the aponeuroses of external oblique, internal oblique and transversus abdominus pass anterior to the rectus itself which therefore rests on transversalis fascia, fat and peritoneum. Fusion of the aponeuroses of the rectus sheath in the midline forms the linea alba which extends from the xiphoid to the pubis. There is a substantial and varied blood supply to the abdominal wall. Of particular importance are the superior and inferior epigastric vessels. The surface marking of these vessels is represented by a line from the femoral pulse in the groin to a point just lateral to the umbilicus. The anterior primary rami of T7-L1 supply the anterior abdominal wall. The intercostal nerves (T7-11) and the subcostal nerve (T12) enter the abdominal wall between the interdigitations of the diaphragm eventually piercing the rectus abdominus to supply the skin. The first lumbar nerve, in contrast, divides anterior to quadratus lumborum muscle into the iliohypogastric and ilio-inguinal nerves. The iliohypogastric nerve pierces internal oblique close to the anterior superior iliac spine and then runs deep to external oblique to supply the skin of the suprapubic area. 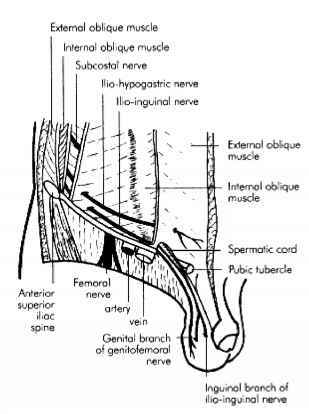 The ilio-inguinal nerve pierces internal oblique and traverses the inguinal canal. It emerges through the external ring (or occasionally through the aponeurosis of external oblique to supply a variable area of the genitalia and upper thigh). There is no deep fascia over the abdominal wall but the superficial fatty tissue may be termed Camper's and Scarpa's fascia (the latter being deeper) although there is no real distinction between the two. Useful landmarks of the abdominal wall include the xiphoid-T9, and the umbilicus-L4. Contents: inferior epigastric artery, spermatic cord, round ligament and fat (see Figure CA.31). The antecubital fossa is a triangle bounded infero-medially by pronator teres, infero-laterally by brachio-radialis and superiorly by a line passing through the medial and lateral condyles of the humerus. The roof of the antecubital fossa consists of deep fascia, which is reinforced by the bicipital aponeurosis. On the deep fascia lie the median cubital vein and medial cutaneous nerve of the forearm. 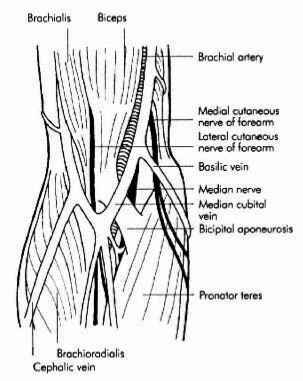 Lateral structures include the cephalic vein and lateral cutaneous nerve of the forearm and medially lies the basilic vein. 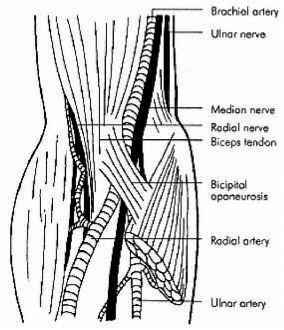 Within the antecubital fossa from medial to lateral lie the median nerve, brachial artery, tendon of biceps and the radial nerve (see Figures CA.32 and CA.33). The major vessels of the head and neck are shown in Figures CA.34 and CA.35.